Nowadays, textile units utilize a number of dyes, chemicals, reagents, and solvents to impart the desired quality to fabrics, and generate a substantial quantity of effluents/contaminants, which cause severe environmental problems if disposed of without proper treatment. 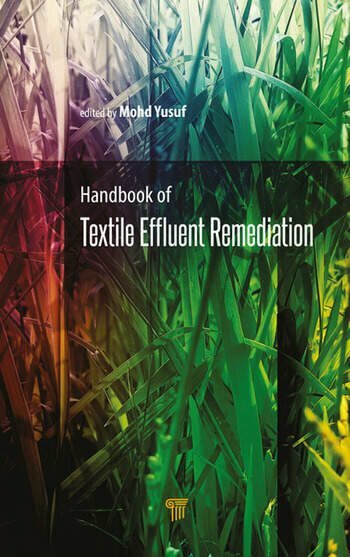 In view of several surveys carried out through research papers, books, technical articles, and general reports published in high-repute academic societies, Handbook of Textile Effluent Remediation provides a detailed narration of the acceptable methods of treating textile wastewater, such as active ozonation, membrane filtration, and adsorption. The book discusses emerging and suitable treatment systems that are viable, efficient, and economical. In this context, it provides an array of several traditional as well as advanced treatment practices for textile effluents. It covers research-oriented descriptions of textile wastewater treatment that can be adopted by scientific communities, academicians, and undergraduate and postgraduate students of industrial engineering, materials science and engineering, physics, and chemistry. It offers several interesting methodologies and aspects of current dimensional research through user-friendly content, tables, and figures and provides up-to-date literature on important and useful information for textile effluents, their impact on the environment, and advanced remediation processes. Needless to say, this book is of immense use to global researchers, academicians, and consultants engaged in various streams of wastewater treatment science. Mohd Yusuf is assistant professor at the Department of Chemistry, YMD College, Haryana, India, and academic councilor at the Indira Gandhi National Open University (IGNOU) Study Centre, YMD College, since 2014. He obtained his BSc in chemistry, botany, and zoology in 2004 and MSc in chemistry in 2006 from Ch. Charan Singh University, Meerut, India, and his PhD in chemistry in 2013 from Jamia Millia Islamia, Delhi, India. From 2013 to 2014, he was a guest faculty for engineering chemistry at the Department of Applied Sciences and Humanities, Faculty of Engineering & Technology, Jamia Millia Islamia. Dr. Yusuf is an editorial board member and reviewer for many journals. He has contributed 11 chapters in books, authored three books, and published numerous research articles with an h-index of 10 and an i10-index of 11. His research interests include green chemistry, biopolymers, biocolorants, biocomposites, natural products, and advanced applied materials.